The XVI century, when the dynasty of Sheibanids captured Bukhara, and made it the capital of the state, is the time of flowering of the city and large-scale construction. During this period the domes of covered bazaars were built, which became the some symbol of the city, its importance on the Great Silk Road. Trade complexes were erected over Bukhara and its surroundings, mainly they were built at the intersection of 2 or 3 roads, but only four trading domes could survive up to date. The name of the dome comes from Sarrafs - moneychangers, who a few centuries ago, exchanged money of traders from all over the world. It can be said that it was one of the oldest currency market of the East. The main dome towers on four massive arches, and has annexes. Today, there are no money changers, but a great selection of Oriental carpets and other souvenirs. Once the architects had the task to build the building of correct form at the intersection of five streets. The solution was the construction of six-sided complex in the center of which the spherical dome towered above, to which the smaller domes of annexes were adjacent. The covered bazaar of Telpak Furushon was located here. At the beginning it was the place of trade of books, and it was called Kitab Furushon, but later it was appointed to trade hats, for men, women and children: skullcaps, scarves, turbans, fur hats. To the north of the dome of Furushon there is the large dome complex of Tim Abdullah Khan, built in 1577. Feature of this building is special lighting, built out of small windows and holes in the domes. It is always cool here, regardless of the outside weather. Over the centuries, people traded here fabrics and carpets, and today this tradition has not changed. This trading dome is considered to be the largest covered bazaar in Bukhara. It is located close to the Poi Kalan, and is the northernmost of all four domes. Another feature of Tak-i Zargaron is the dome shape – it is stretched up, and has vertical protruding ribs. Its name derives from the 36 workshops and stores of jewelers, because "Zargar" translated as "jeweler". 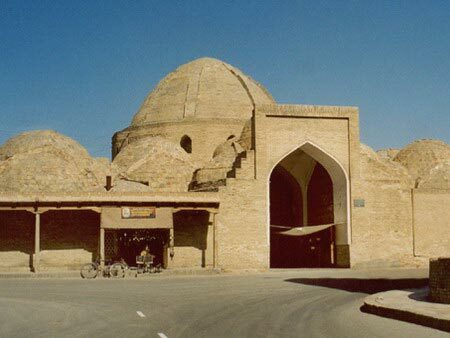 Built in 1569-1570, it became the first trade dome of Bukhara, which has just acquired the status of capital.